Arnold Alois Schwarzenegger (b. Graz, Austria 1947) is an Austrian-American actor, politician, steroid-enhanced bodybuilder, and businessman, who served as the 38th Governor of California from 2003 to 2011. Anti-Trump, Schwarzenegger unsuccessfully replaced Donald Trump on The Apprentice, resulting in a ratings collapse of that show. More recently Schwarzenegger has devoted himself to nonpartisan redistricting. Schwarzenegger rose to fame with action movies including Commando, Conan the Barbarian and the Terminator franchise. His on-screen presence was characterized by his large stature, as well as his thick Austrian accent. Once one of the highest paid actors in Hollywood, Schwarzenegger has recently returned to acting, following the end of his term as Governor. After sitting Governor Gray Davis mismanaged electric power deregulation and instituted a new registration tax by executive order, infuriated citizens initiated a petition to place a measure on the ballot to remove him from office. Despite Democratic predictions that the petition would fail, it was delivered to then Secretary of State Kevin Shelley with more than the required number of signatures. In accordance with the law, Lieutenant Governor Cruz Bustamante became Acting Governor and called a special election for October 7, 2003. The election was only the second of its kind in United States history. Approximately 180 citizens, from all walks of life, declared candidacy. Schwarzenegger was rumored to be considering a run for office, which was confirmed on an appearance on the NBC TV Tonight Show. Schwarzenegger easily defeated Cruz Bustamante in the election. 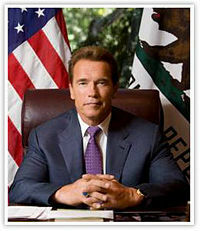 After the election was over, Schwarzenegger was sworn in on November 17, 2003, to serve the remainder of Davis' term. Despite a period of sagging poll numbers, Schwarzenegger was reelected by a landslide on November 7, 2006. He defeated Democrat Phil Angelides, the then-State Treasurer of California. Despite being a Republican, he holds some liberal views. He is a supporter of gun control and environmentalism. He is a staunch supporter of a law that mandates the use of Californian taxpayer money to fund stem cell research - which is the cloning and killing of human embryos for experimentation; he is also pro-abortion. Arnold officially approved an assisted suicide measure allowing nurses to sedate, dehydrate and starve depressed or confused individuals they consider to be "terminally ill." (Compare euthanasia.) Governor Schwarzenegger also campaigned against the famous California Proposition 8. He married Maria Shriver, a famous journalist who is a member of the historically liberal Kennedy Family. Because of these and other policies he is often referred to as a "RINO," a "Republican in Name Only" by many conservative Republicans. Other sources have labeled him a "California Republican," meaning that his political policies are conservative but his views on civil liberties lean to the liberal side, reflecting the general attitude of most Californians. During his time as governor, the debt of California continued to balloon, forcing the state to pay IOU's for a period in 2009. Due to the budget crisis's under his tenure, Republicans lost the state to Jerry Brown in the 2010 Gubernatorial election. This page was last modified on 2 April 2019, at 00:48. This page has been accessed 46,439 times.